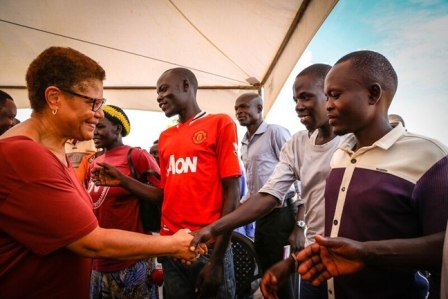 This past weekend, Rep. Karen Bass (D-Calif.) returned from a Congressional Delegation led by Rep. Chris Smith (R-NJ), Chair­man of the House Subcommittee on Africa from a Congressional Delegation to famine-stricken South Sudan and neighboring Uganda. The delegation visited aid sites in both Uganda and South Sudan, including Bidi Bidi, which became the world’s largest refugee camp in April. Rep. Smith and Rep. Bass also met with President Yoweri Kaguta Museveni of Uganda and President Salva Kiir Mayardit and First Vice President Taban Deng Gai of South Sudan. The trip lasted 6 days. As of May, there were nearly 1 million refugees from South Sudan living in Uganda according to according to U.S. Agency for International Development (USAID) estimates. In order to shore up international support, Rep. Bass is joining other Members of Congress in meeting with ambassadors to discuss reaching the UN’s $4 billion goal as well as future strategy to address the ongoing root causes of the famine and impending famine in Africa and Yemen.